A “perfect colleague” who worked for a regional daily for more than 40 years has died aged 71 after suffering oesophogeal cancer. Tributes have been paid to Pam Young, left, who worked as personal assistant to four editors of Stoke daily The Sentinel. Described by former colleagues as “part of The Sentinel’s history”, Pam saw her role expanded into supervisory and departmental management over the course of her career. She also wrote a badminton column throughout her time with the newspaper, and was a founder and organiser of the Stoke-on-Trent Sports Awards. Pam joined The Sentinel in 1963, aged 16, as a copy-taker in the newsroom, and was given a trial as secretary to editor John Tupholme three months later. She retired from the role 40 years later having worked for a further three editors, but still “on probation” because the end of her trial was never officially recognised. Sean Dooley, the last of the four editors she worked with, told The Sentinel: “[Pam was] the perfect colleague. Helpful, friendly and supremely efficient; she carried out a demanding set of duties as editor’s PA with discretion and sensitivity and held the full respect of everyone she dealt with. 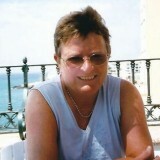 “Pam was well-known and highly regarded in sporting and business circles in North Staffordshire and it was her lifelong interest in sport, playing and reporting on badminton, that led to her wider public role as organiser of the sports awards – a position she held with great distinction until her retirement. Pam met Carol Jones, her partner of 36 years, through badminton and the couple celebrated their relationship with a civil partnership in 2006. Pam is also survived by sister Sue, brothers Billy and Roy, nieces, nephews, great-nieces and great-nephews. Her funeral was held on 9 October.